Intricate uppers are high on this season's style agenda - and what better way to get on board the trend than ONSTAR, a contemporary take on classic brogues. 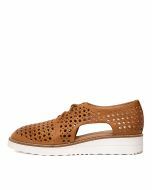 Crafted from perforated leather with cutout quarters, the pair is finished with welt midsoles and chunky white platforms for a sports-luxe feel. Wear them effortlessly with everything from tailored trousers to denim dresses.